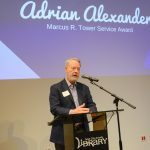 The Tulsa Library Trust is pleased to announce that Adrian Alexander has been awarded the Marcus R. Tower Service Award for 2019. Alexander accepted the award at the 45th Annual Volunteer Appreciation Celebration at Central Library on April 7. 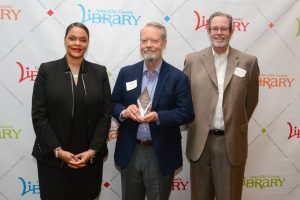 The Tower award was created by the Tulsa Library Trust and the Bank of Oklahoma to honor the longtime contributions of the former Library Commission chairman and Trust board president. A bank executive known for his generosity and vision for the community, the award was created in 1998 to honor others like Tower that volunteer and support the Tulsa City-County Library over a sustained period. The award includes an engraved crystal trophy and a gift of $1,500 from the Tulsa Library Trust, given to a library service or program of the recipient’s choosing. Adrian Alexander has served at the University of Tulsa as the first R. M. and Ida McFarlin Dean of the Library since February 2007. Alexander says he met Peggy and Walt Helmerich his first week on the job. That summer, Peggy called and asked Alexander to serve on the Author Selection Committee for the Peggy V. Helmerich Distinguished Author Award, and he has been doing that job with great pleasure and pride ever since, serving as the chair of the committee for the last several years. The Tulsa Library Trust depends on financial gifts to pay for valuable programs today and build the endowment fund for the future. With your financial support we can make a difference. © Tulsa Library Trust 2017. Tulsa Library Trust is a 501 (c) (3) organization as designated by the IRS. Financial contributions made to Tulsa Library Trust are tax deductible.